I've been working on four articles lately, so I've been a bit overwhelmed. 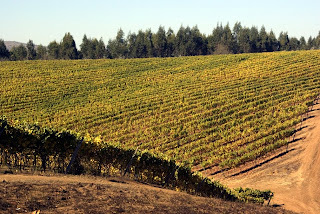 I need a bit of a break, so this post will be a light one- just a few words about some wines I've enjoyed lately. Cline Cellars in Sonoma has an unusual mix of wines available; instead of Merlot, Cabernet Sauvignon and Chardonnay (what I like to call the vanilla, choolate and strawberry of the wine industry - put them in any order you wish), they feature offerings such as Pinot Gris, Viognier, Mourvedre and some wonderful old vine Zinfandels from Contra Costa County. Two summertime wines I tried from them recently that offer great pleasure are the 2008 Marsanne/Rousanne and the 2008 Mourvedre Rosé. The Marsanne/Rousanne is a particularly delightful wine with exotic aromas of lime, orange peel, apricot and papaya (no oak- thank you!) and it's got nice acidity which gives this wine a freshness that makes it appealing on its own or with a variety of dishes from chicken salad to Oriental cuisine. There are a lot of BYOB Thai restaurants in my hometown of Chicago (and probably a few where you live as well); this would be perfect for an occasion like this! The rosé is one of my favorites I've had from California in some time; it's medium-full, dry and has good depth of fruit. You'll find the usual cherry and strawberry fruit flavors along with a touch of watermelon. I'd love this with salmon or perhaps as a contrast to grilled chicken. Both of these offerings from Cline retail for $16 and are ideal summertime wines. A different type of summertime wine is the 2007 Colle Massari "Melacce," a white wine made entirely from the Vermentino grape. This variety is grown primarily in Sardinia and Tuscany; this particular example is from the Montecucco area near Montalcino in south central Tuscany. It's a lovely dry white with no oak and aromas of red apple, quince and even a touch of sweet pea. 2007 was a superb vintage and this wine still has a lot of freshness. This is ideal with most seafood, especially shellfish, but would also work well with risotto. At $21, this is a wonderful value. The South African bottling is my favorite of the 2008s from this producer. It's got beautiful aromas of gooseberry (classic for cool climate Sauvignon Blancs), lime and yellow pepper; it's medium-full, delicious and quite rich in the finish with excellent acidity. This is a wonderful example of a Sauvignon Blanc that combines pure varietal fruit with just the right touch of herbal characteristics. I can think of dozens of food pairings for this, from grilled shrimp to ceviché to mussels in their own broth. Best of all, this is a great value at $18! At Eat Wine, Liz Caskey, an American who now lives in Chile, normally addresses local foods and wines. 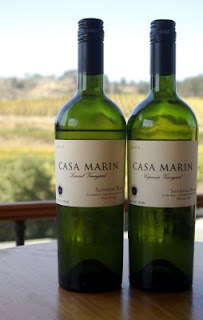 Her new post (read here) is about three wines that her husband and she recently enjoyed. They include a gorgeous Maipo red, as well as a lovely Albariño from Uruguay (a surprise to many of us, but not to Liz) and a beautiful Ribera del Duero from Spain. Nice descriptions of the wines as well as some excellent food recommendations. At The Blend, Alonso Cevola addresses a timely issue - some great rosés for summer (read here). This one's all about Italian rosés, from Piedmont to Sicily and there are got some great choices, including the 2008 Centine from Banfi. Alfonso, I've got a bottle at home and based on your recommendation, I'll try it tonight! Finally at VinoWire.com, Jeremy Parzen has posted his translation of a letter from the Consorzio in Alba that promotes Barolo and Barbaresco. The letter was sent to my friend (and Jeremy's blogging partner) Franco Ziliani in Italy; it has to do with a defense of the 2006 vintage in the Langhe. 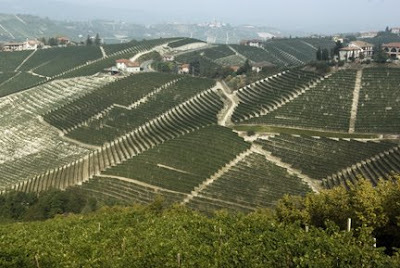 As influential producer Bruno Giacosa is not bottling any Barolo or Barbaresco from the 2006 vintage, doubts have been raised about the vintage. You can read the letter here; this is a fascinating issue that may not go away for awhile. I can attest to dozens of very good to excellent examples of Barbaresco from 2006 that I tasted in May in Alba (I'll taste the 2006 Barolos next year). We may never know the complete story as to why Bruno Giacosa made the decision not to bottle his 2006 Barolo or Barbaresco (he did bottle his 2006 Barbera and Nebbiolo d'Alba), but I see no reason for speculating on it- what's done is done. It is a shame that some "journalists" out there have put their own spin on this by claiming that this is a clear message that 2006 was not a succesful vintage in the Langhe. It was indeed - just try the wines! Kudos to Franco and Jeremy for reporting on this! If you want to read more about the 2006 vintage in the Langhe, Franco Ziliani has just written an article for the Association of Italian Sommeliers site (read here). This is an excellent article (in Italian) with comments from several producers of Barolo and Barbaresco. A few excerpts: Sergio Barale, a first-rate Barolo producer speaks of "the beautiful structure and color" of his 2006 Barolos and Barbaresco. 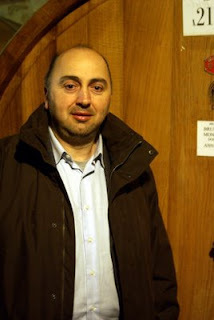 Maurizio Giacosa of Fratelli Giacosa in Neive, talks about the aging potential of his 2006 Barbaresco, mentioning that they "are not inferior to his 2004 or 2005." Tino Colla of Poerdi Colla says that "2006 is in line with the two years that preceded it and with the two following years." In other words, 2006 is an excellent vintage! A typicallly excellent article from Franco Ziliani and one that should clear up confusion about the quality of the 2006 Barolos and Barbarescos. Grazie, Franco! Earlier this year, I visited several of the major wine zones of Tuscany, from Chianti Classico and Montepulciano ot Montalcino and Bolgheri. I have just put together a collection of my reviews of the latest wines from Tuscany. These reviews can be found in a special Tuscan issue of my newsletter, Guide to Italian Wines; this is a 30-page pdf document. This issue contains reviews of 50 different Brunellos from the 2004 vintage, as well as reviews of wines from six different estates in Bolgheri (including three vintages of Sassicaia), as well as 40 new bottlings of Chianti Classico, a dozen examples of Vino Nobile di Montepulciano and even a couple newly released bottlings of Vin Santo. The price for this special issue is only $10 US. I will mail the issue to you upon payment (either check or Paypal), so if you are interested, please email me and I will reply with payment instructions. This is a must for a Tuscan wine lover!